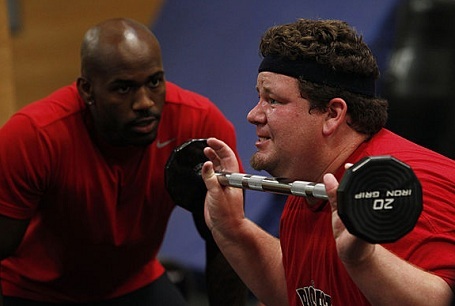 As the biggest loser continues its progress in its 12th season, it continues to inspire, motivate, and support its contestants as well as viewers. In the 9th episode that aired on November 15th, 2011 trainer, Dolvett speaks to contestant John about his struggles in life that have brought him to where he is today. Dolvett tells John about how when he was a young child his father left his mother, brother, sister and himself and his mother had a very difficult time adjusting to this. So much so that she focused all of her efforts on getting him back instead of on her children. Social workers became involved and removed the three children from their biological mother. The children were all placed together in a foster home which became a foster-to-adopt transition. As the social worker stayed a part of the children’s lives she developed a life-book for Dolvett that he still has to this day. It includes a picture of him when he was 4, pictures of his adoptive parents, his siblings, and the children with their social worker. Also included are notes and stories that the Social Worker believed were important in the development of Dolvetts life. Social Workers often get a bad wrap for taking children out of their homes and separating families. However, I believe this worker did a fantastic job of keeping the siblings together and doing her best to create a positive memory of this experience. There were some parts of Dolvetts story that were negative, as a great deal of life stories have, but it was nice to see that he had used his hardships as inspiration to become what he is today. He could have simply used his challenges as an excuse to go down a bad path but instead chose to make a healthy life for himself. He also used his story as a way to inspire and motivate others, such as John.